Saint Dominic was born in 1000 in Cañas, Navarre, Spain. He was born a peasant, and as a youth worked as a shepherd until he entered the Benedictine monastery in Navarre. When Dominic refused to hand over the monastery lands at the King of Navarre’s demands, he was forced to leave the house with two other monks. He fled to Old Castile and was welcomed by the king. He then entered the monastery of San Sebastian in Silos, an almost dilapidated abbey with a mediocre physical and spiritual regimen. 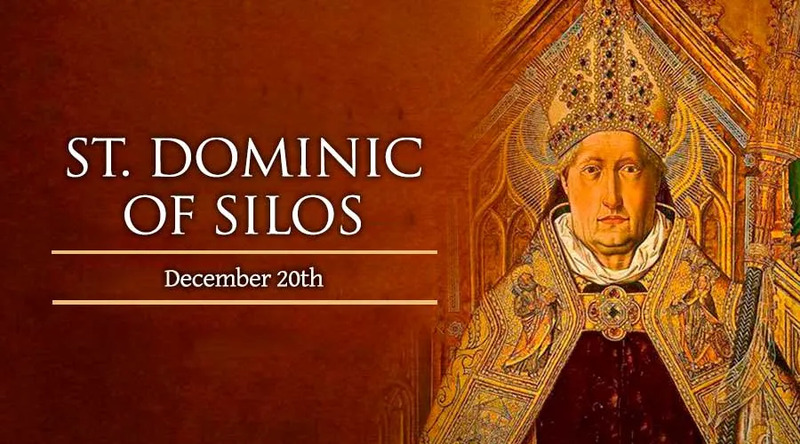 Within very little time, Dominic, who had been elected abbot, renewed the spirit of the monastery and rebuilt it’s structure, it’s finances, and it’s works of charity. Dominic was known for miracles of healing, which he obtained through prayer and for his work of ransoming Christian prisoners from the moors. He died on December 10, 1073 in Silos, Spain.